On May 1st, nike will resurrect the Nike Air Solo Slide, dubbed the Clogposite. We’ve known this was coming for a while, but after 5 years off the shelves Nike will bring back one of their least popular silhouettes. Essentially a slipper-form on a Nike Air Flightposite, given the shape and material they’re given the nickname clogposite. 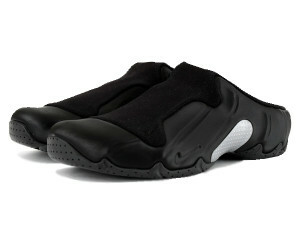 The Clogposite was last seen in 2009 and so far we know we will get a black and white version of the Solo Slide. Altho they don’t release until May in the US, they are already available overseas at the Undefeated store.